When I am not working on clocks I occasionally find time to enjoy my many hobbies which include reading books, painting, model building, drawing and playing the drums. All of these fit in very well with the mind set necessary for clock repair. I have always loved art. I took art in school every chance I could get. Unfortunately we never spent much time painting and never in oil. 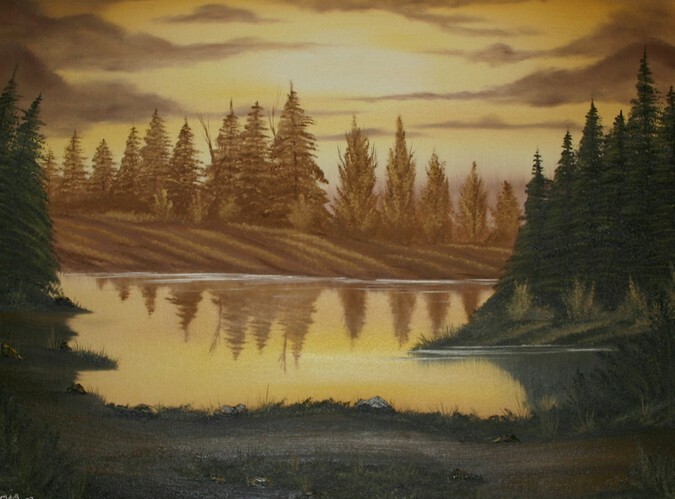 One morning many years after high school my young son and I were up early one Saturday morning channel surfing when we saw Bob Ross's painting program, "The Joy of Painting" on PBS. My son and I stopped to watch, mesmerized by the speed in which he created the beautiful painting. 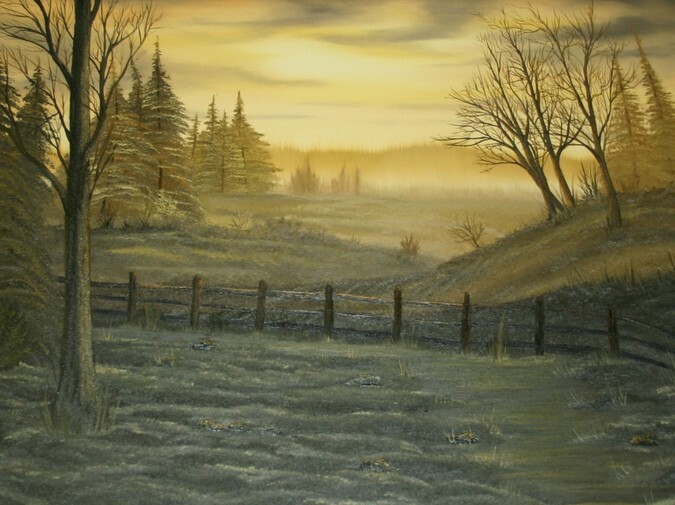 I commented to my son that I would love to try painting sometime, imagining myself many years from now in retirement painting beautiful landscapes. Lo and behold, the following Christmas there was a Bob Ross paint set setting under the tree. Retirement had to wait, I had to give it a try. I completed about 7 or 8 paintings on my own never quite happy with the results. Some parts of the painting looked very good whereas others were severely lacking. I decided to take a painting class. The two paintings below were the result of a little education. Once I took the class I quickly learned that there were things Mr. Ross was not telling you during his very short programs. I prefer my paintings to have more color in them but this happened to be what the instructor was teaching the two weekends that I took the class. The muted colors do lend a certain "old world" quality to them. With the additional instruction Bob had left out I was able to complete a couple paintings that I was mostly happy with. Unfortunately I have not had a chance to paint again since these were painted in 2003. I have been playing drums since the age of 14 and have been in various local bands over the years including a 14 year stint as a drummer for the worship team at a church I was attending at the time. I did not take drumming very seriously until I was in my 30's when I began to learn to read drum music and applied myself to learning more difficult drum arrangements, particularly the music of the rock band Rush. Here is a cover of the song Freewill by the same. Click on the word below to be view the video. I also recorded a number of songs with my older brother Mark, a very talented guitar player, keyboard player, lyricist and song writer. After his death in 2015 I made a tribute video of one of the songs we recorded together. The progressive style rock song "Stronger Than Stone" was recorded in our home studio back in 1987. The comment section under the video contains further information. Click on the song title below to see the video. When I was in elementary school the local 7-11 used to carry model car kits. 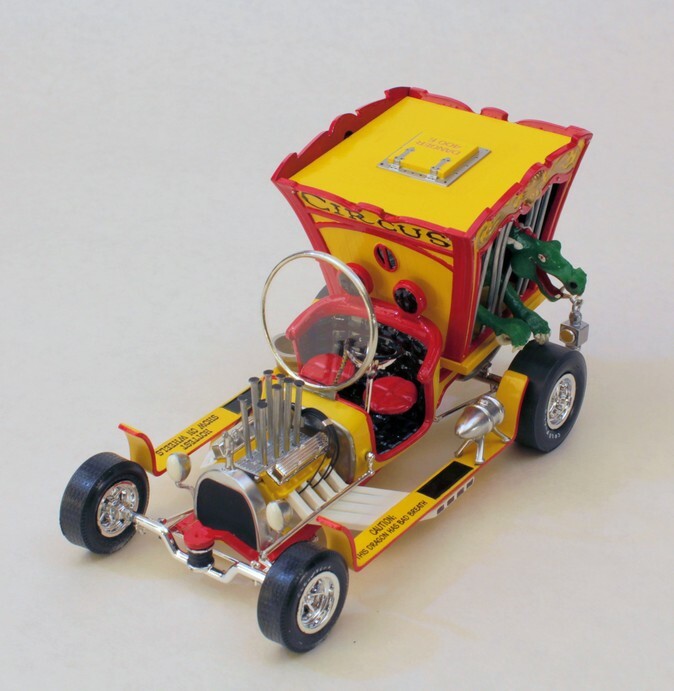 As a young boy the cars that interested me the most were those that looked like the cartoons I used to watch. I would buy them and rush home immediately and begin to put them together in my back yard, usually in one sitting. I rarely painted them and if I did I did not do a very good job. Using an air brush or even a can of spray paint was unheard of at the time. Most of these models ended up getting set on fire with lighter fluid or blown up with fire crackers. 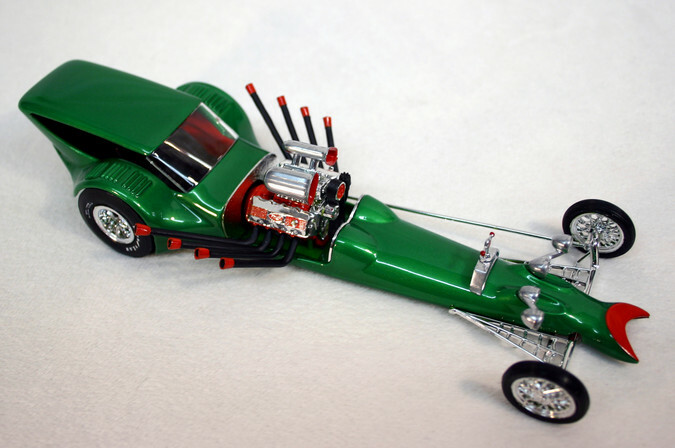 Almost all of these "cartoon" like over the top car models I built were designed by a man named Tom Daniel. We call them "Show Rods". When I got older I decided to begin to re-purchase some of these kits I had built so long ago. None of them were available at hobby shops at the time so I had to go to ebay to find them. Many were selling for very high prices. Over the years I have been able to accumulate some of these "memories" and a few of them are shown below. This is one of the few cars he designed that was not a "cartoon". This was actually a model of his own personal custom Corvette. How cool is that?! 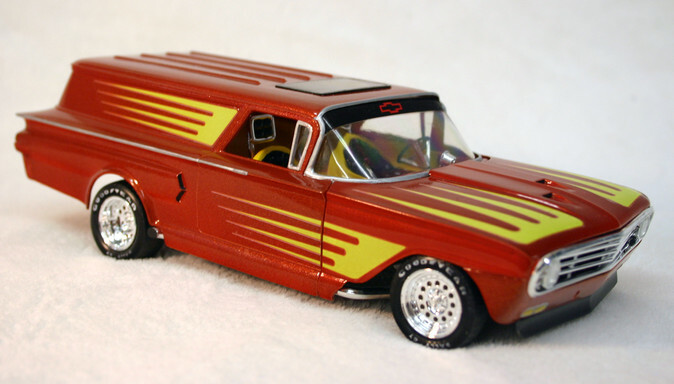 Many of his car designs carried a name related theme that was spread across the entire model. Here we have the spider theme displayed through spider leg headers, spider mouth front end and spider webs. 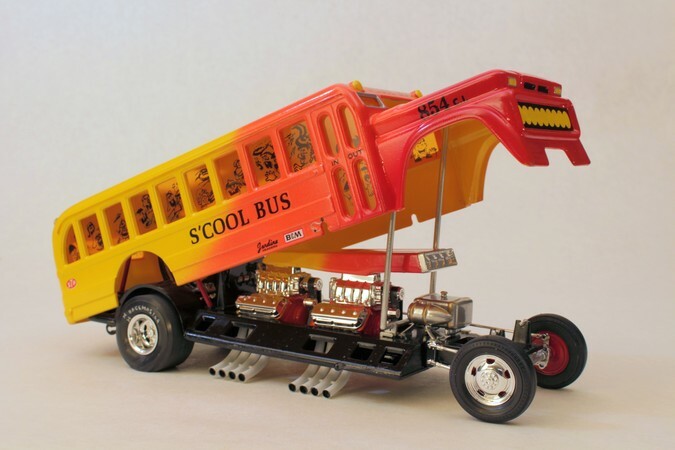 There aren't many things less "cool" than a school bus but Tom Daniel worked his magic and designed this very "cool" dragster style "S'cool Bus". 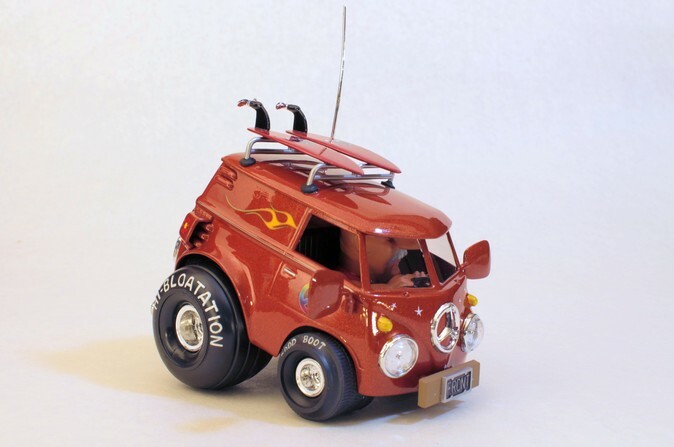 One of my all time favorite Tom Daniel's models, the circus themed "Dragon Wagon". I specifically remember building this in the grass in my backyard when I lived in California. This is the one I could not wait to buy. Unfortunately at the time it had never been reissued and un-built examples of this model were selling for hundreds of dollars. I finally found a poorly built one (affectionately called "glue bombs" by those who build as a hobby) for a reasonable price. I dismantled it as best as I could, stripped all the paint and re-created the "model of my dreams". Speaking of "cartoon" style models, these next two fit that description very well. There is no attempt to make these vehicles look any where close to an actual car. 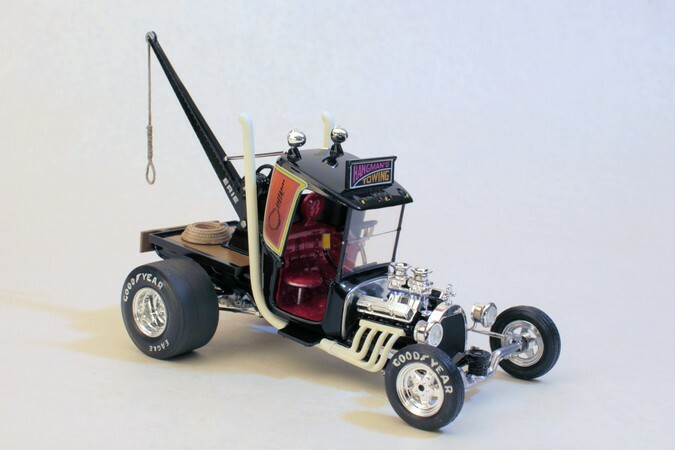 Oversize wheels, drivers and engines make these a great deal of fun to build and display. I do not build many military models but I do like those from the World War II era. I built this so long ago I cannot recall the specific name of the tank. This was the first model I ever used an airbrush on. I like to doodle when I am bored. When I was a teenager I had seen a logo for a band where the band's name was written in such a way that the name would look the same whether it was viewed right side up or upside down. I loved the cleverness that was involved in creating the letters in a way that could pull this off. It was not a mirror image of the word like the name being reflected onto another surface but a single word that looked exactly the same; right side up or up side down. I memorized the way it was accomplished and often re-drew the logo when I was doodling. One day I decided to try to create my own name logo using the same concept. Now at first you might not see anything special here, just a fancy way of writing the word "Mike". But turn the image over in your head (unless you can stand on your head to look at it) and you will see that the word reproduces itself exactly either way it is viewed.